Look at my Carrot Cake! :) I hope you're all having a nice weekend. 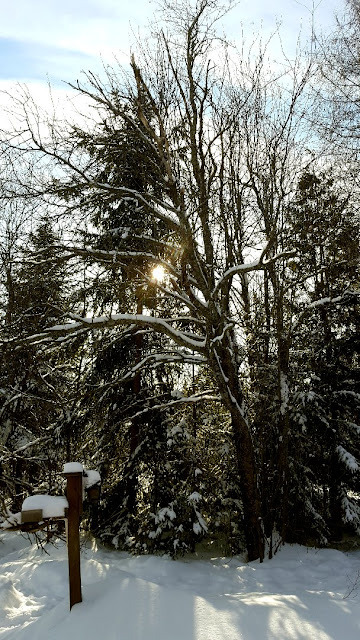 It's snowing today and the snowmobiling neighbours left early to go back to the city, so everything is nice and quiet! :) I have a chicken brining and we're going to have a roasted chicken dinner tonight. What's on your plate these days? I didn't realize how much of that cream cheese frosting I'd loaded on top until we cut it! 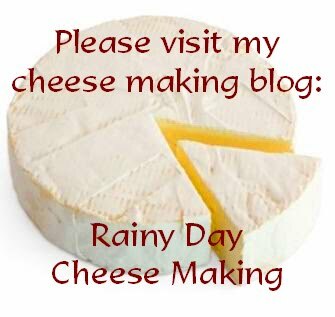 I'm challenging myself to try a new recipe each week and I'll post about that on Sundays. The new recipe I tried was Cheddar and Cauliflower Soup. I decided to start my own tradition to welcome spring. I wanted to plant some seeds. 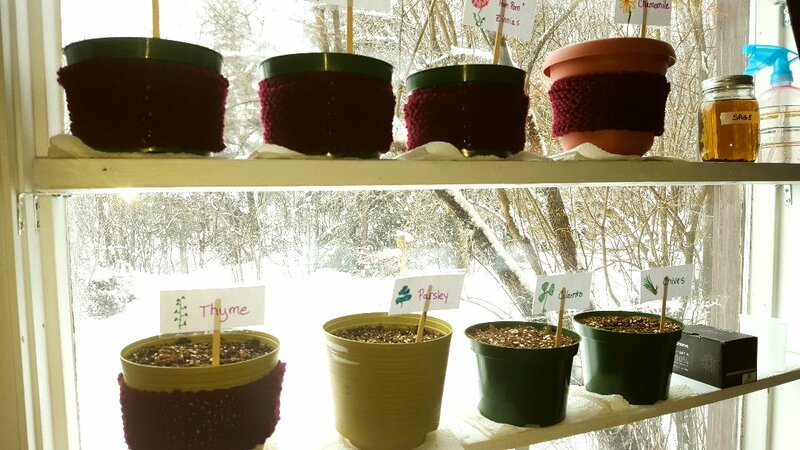 Our winters are so long that I thought it would be nice to have some flowers and herbs growing by the window. 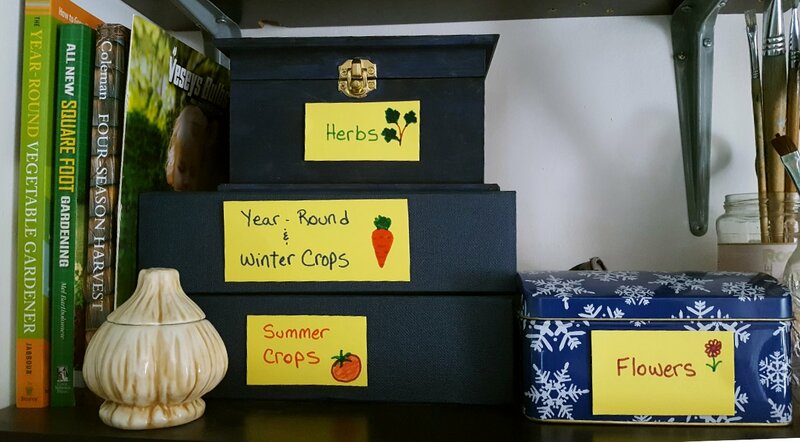 I finally organized my seeds too! I have four types of flowers and 4 herbs planted! See the burgundy on the pots? Plant cozies! :) I'm trying to give the plants a little help with some extra warmth...who knows if it'll work or not? I have three more to knit! The window is very sunny during the day so that's not a problem, it's the cold nights where I worry that the plants might not be too happy. Wouldn't it be lovely to have flowers growing in about a month or so? Oscar and me. :) Lately Oscar has been sitting on my lap and watching "bird television" on You Tube with me. He loves it! When I turn it off though, he walks behind the laptop trying to find out where they went! I love the way you structure you life (and food!) around the seasons and celebrations. Seems very natural, the way it should be. Good looking cake, you have put me in the mood for carrot cake and luckily this time I actually have some. Snow, sleet and freezing rain here. Man oh man, look at that cream cheese frosting -- yowza! Love your soup bread bowls too. And Oscar is so cute! HRH also used to watch movies in bed with My Rare One and her laptop. Lol-when I saw the cake slice I thought 'she's like me! the cake is there to hold up the frosting' then I read what you wrote. Your soup bowls are neat. I'm not a brave cook, tend to only make the same things. Your predicting clouds remind me of the halo around the moon forecasting rain - although I never kept track to confirm the accuracy of that. My neighbor's cat was in the wood shed this morning. Trigger was very angry at the invasion and loudly protested. I don't know if cats ever make friends like dogs will. If I could reach through this screen, your carrot cake would go mysteriously missing! That carrot cake looks sooo good! What a fun, dog house tent. 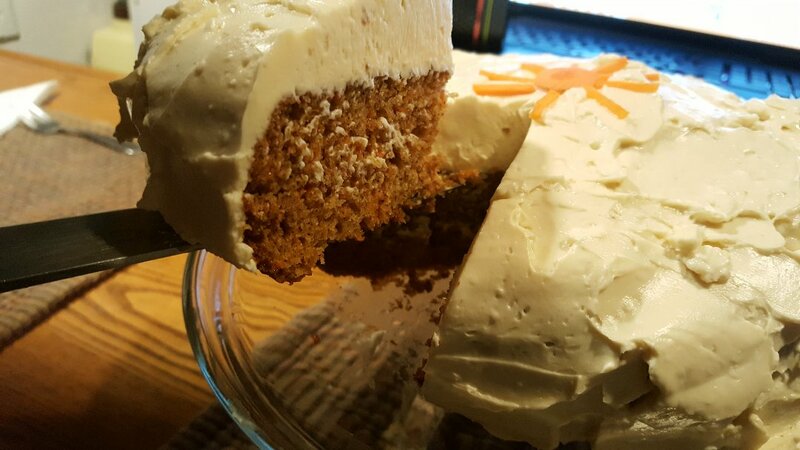 LOVE the thick layer of frosting on your carrot cake; yummy! And I love your seeds set up. I want to grow something in our kitchen sill where some of the best light is. Rain, your posts are always so much fun to read. I don't even know where to start. Maybe I'll start with the cake...LOL... I love that the dogs have become such good friends. Isn't it heartwarming? Was it insecurity that had them butting heads? An alpha dog competition? Territory dispute? Or an argument on who gets the last piece of your cakes and pies? LOL Just joking. I'm really happy that things have turned out well. Oscar and the bird television...hahahaha...adorable! i would love that soup bowl recipe! oscar is too cute! you should put cloches on the plants. just use clear plastic cups. that would help a lot! we were supposed to get snow but it became warm and rained. we are heading north on tuesday to a 'snow event' which is now what they call a snow storm! i need a good snow fix. spring will be here too soon. your soup in the bread bowls looks so good,, yummo! It is seed time,, exciting!! Ohhhhh, the frosting on your cake!!!!!! Yesssss!!!!! 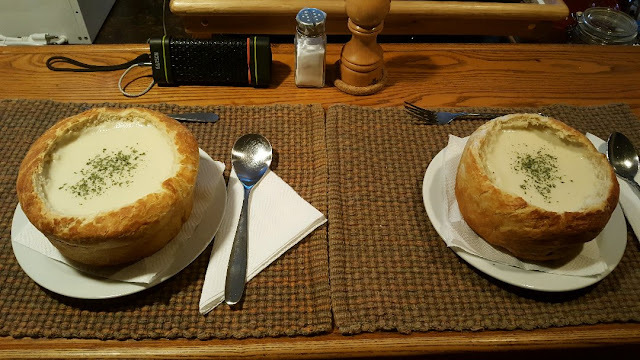 Never tried a bread soup bowel, but what a great presentation they make. 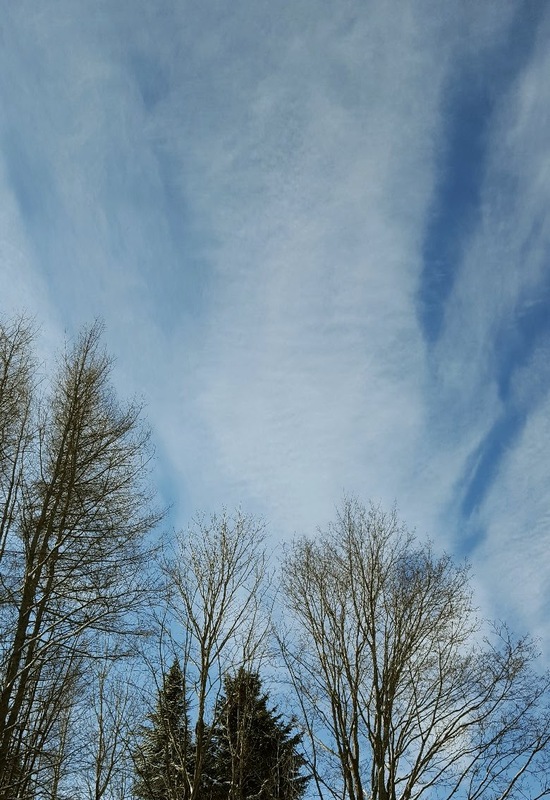 Never heard the painter's brush clouds lore. Have heard that 'horses tails' foretell bad weather, though. Your critters are so cute. Like Oscar, Lily walks behind the tv trying to figure out where it is coming from. So funny....I wonder all the time what my babes are thinking. I love that the two dogs are not fighting anymore. That can be stressful in itself. Wow...hoping that you have some beautiful flowers come up. I was reading a blog today about African Violets and thinking just how pretty they are. I used to have a couple but lost them....thinking I need some for my deck this yr. Purple ones! I love Purple flowers and I think I have several different purples in my flower garden. We love carrot cake here! Your version looks delicious Rain! Love the doggies sleeping together, and that Oscar is just the neatest cat to watch bird-TV. 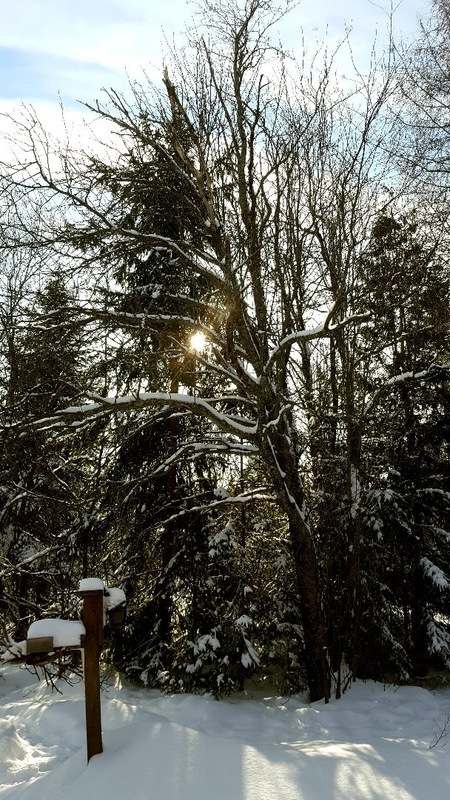 I haven't even thought about my garden yet - probably because it is firmly encased in snow and ice right now. I just LOVE your pot cosies! What a great idea! Can't wait to see if they make a difference. How nice that the dogs are all getting along. It is such a necessity with five of them. I had an Irish Setter once that used to stare at bird TV, then try to find the birds behind the set when it was turned off. I love that garden window! Also carrot cake is one of my favourites. I don't want to say diet but I have changed my eating habits since the New Year...eating a lot of lettuce wraps with various things. That soup looks so good but I would not be able to eat the bowl!!! I love honoring the seasons and the foods to go with it. If we just listen to our bodies, it will whisper to us what we need to do for nourishment. Now that we are getting lighter at night, my body is starting to shift to lighter meals. And I am listening to it! 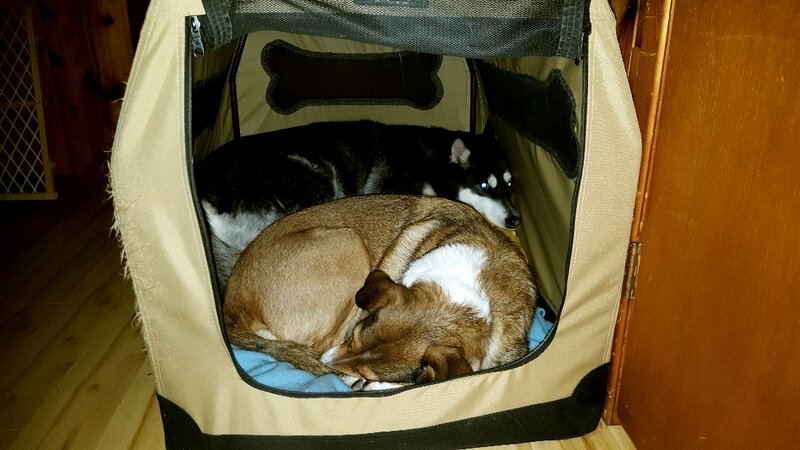 Love that the pups are sharing a den! Well done!! Hi Mama Pea :) Thank you :) I'm so happy that all the dogs are feeling good here and safe - for me the security part is the most important. I don't ever want them to feel abandoned or insecure that we will ship them off somewhere again. Poor souls! I do hope that my flowers and herbs grow in the window! I have high hopes again! :) I think I have enough seeds from last year, except I need starter potatoes, but otherwise, that's my BIG seed order for this year! Hi Gill :) Thanks! I'm glad you have some cake to eat! Hi Debra :) Yeah, I could eat just the cream cheese frosting on its own lol. The cats are so funny. One of ours has zero attention span but the other two can sit for hours in front of the laptop! Hi TPals :) That's funny!! I DO believe the cake is there to hold up the frosting lol...but that cream cheese frosting is RICH...I'm sure it would have tasted great on a bagel! :) When I met Alex he had two cats and we added a third. They don't really hang out together, they fight...the dogs though, they become really dependent on each other. At least in our home. There is a LOT of snow in the forecast here too for this week...I don't want to shovel anymore boo hoo hoo! I'm so tempted to take some savings and get either a snowblower or a snow service...but we're trying to save money so we figured we'd "man up" and do the shoveling ourselves. Oh you've stumped me! "Hope those flowers up and give the people hope"...please tell me which movie!!!! Hi Jenn :) The chicken was FALL OFF THE BONE...and I only get that result if I brine it for about 4-6 hours. I just fill up a bowl with cold water, add about a handful of brown sugar and a handful of Kosher salt, mix it up , put the chicken in and it stays in the fridge before I cook it. I will never NOT brine a bird! 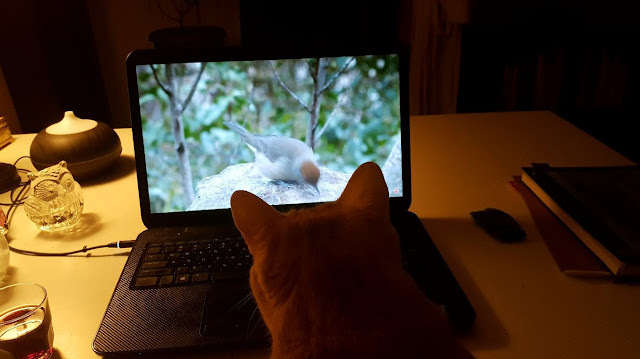 :) The cats are funny with the bird videos! Especially if a squirrel happens by! Hi Jenn :) Oh good luck with your new eating plan!!! I know what you mean, the word "diet" has been so skewed into some kind of weird definition since the 80's. It's linked with women losing weight rather than what you actually eat. You are an amazing cook Rain! My mouth is watering! I believe in weather lore! I think that is so cool about the sky! I will have to watch out for that now! Love that you are planting your seeds! Those plant cozies are special! Your puppies are adorable! I haven't stopped laughing about your cat looking for the birds! LOL! Big Hugs! When I saw that carrot cake my mouth started watering. LOL I knew that would be a hit. YOu are quite the cook. Love the bowls. neat and good too I bet. I love the curiosity of a cat! 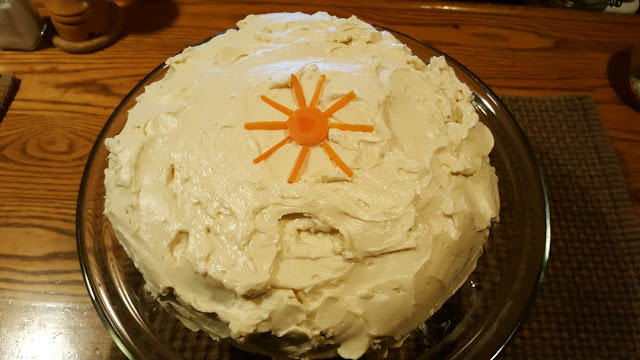 Oh, that carrot cake look SO good. I am staying away from fats therefore none for me. I looked up pancreatic diet and am trying to follow it and it seems to be better although except for bacon and butter I was already eating pretty healthy or so I thought. I will live vicariously through your "yummies". Are your ancestors Celtic by any chance? Look at you with the gardening and the weather lore...you are such an interesting person, Rain. 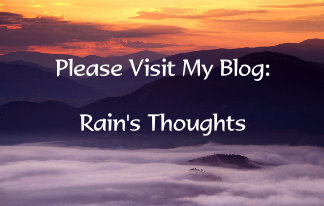 I'm sorry I have fallen behind in reading your blogs as they are so uplifting and really motivate me! Look at those 2 sleeping together....amazing! It's the love and peace that permeates your home so they feel safe and well cared for. Absolutely love the bird t.v.....what a hoot! I'm going to go find it on my t.v. for Grace. She actually likes to watch t.v....the only one besides me.